The Canadian Pain Society (CPS) is a group of health professionals and researchers interested in pain research and management. As a chapter of the International Association for the Study of Pain (IASP), the CPS "supports the treatment of pain as a basic human right and is currently advocating for a Canadian National Pain Strategy". 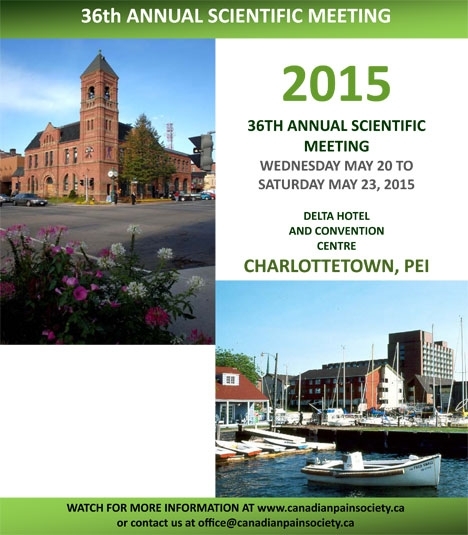 This year, our faculty member Dr. Pat Morley-Forster and our PGY4 resident Dr. Colin Phillips will be attending the conference in Charlottetown, PEI. Dr. Morley-Forster will participate as a Chair for the Pain Medicine Specialty Committee meeting. Dr. Colin Phillips will be doing a poster presentation titled, "Competency based education in ultrasound guided pain interventions", co-authored with Dr. Geoff Bellingham. Poster abstract submission is open until Thursday, May 7th. Register online before May 20th!